Nuclear power is a critical player on the global energy stage and it looks to be rebounding in popularity, especially amongst investors. Since President Trump took office, the Global X Uranium ETF, a basket of several big uranium mining stocks has been up nearly 40%. And that’s without Trump uttering a word about his stance on nuclear politics (although he has appointed the pro nuclear Rick Perry as Secretary of Energy). Several media outlets have been pushing the uranium barrow and it is a sentiment expressed worldwide. In a Daily Telegraph article in November last year, Berkeley Energia (LSE |ASX:BKY) made the paper with regard to the 500 jobs it hopes to create in a depressed former mining region. BKY put the shovels to the dirt in August 2016 in Western Spain, near the ancient city of Salamanca, and started work on a £80M uranium mine. It is a good time to be mining for uranium, especially if you have hold of a mine that will be one of the world’s biggest producers – supplying over four million pounds of uranium concentrate a year, equivalent to approximately 10% of the continent’s total requirement, as BKY do. A further advantage for BKY, is its expectation that it will come into production just as the market rebounds. Anyone who follows the uranium price, knows it hit spectacular highs in 2007, with the price increasing some 450% in a matter of months following the flooding of the Cigar Lake Mine in Saskatchewan, which created fears of a short term supply drought. The boom didn’t last and the industry was dealt a heavier blow after the Fukushima disaster, when the nuclear future seemed abandoned. Since that fateful day, uranium has been one of the world’s worst performing commodities, but as we alluded to above the price may have bottomed out, which can only mean one thing: a rebound is imminent. Uranium prices may rebound after downturn , The Bottom for Uranium Stocks is In , Uranium Prices Set to Double by 2018 are just some of the headlines we are now seeing. So with BKY on course to become the world’s 9 th largest uranium producer, it is really in the gun to meet its objective to become one of the world’s lowest cost producers, reliably supplying the world’s leading utilities with fuel for base load clean energy from the heart of the European Union. Here’s some of the more recent highlights that are stacking up for this near term uranium producer. Major land acquisitions completed ahead of commencement of Salamanca mine construction – leading to additional resource growth down the track? That’s a solid achievement and bodes well for BKY’s future, so let’s take a broader look at the story so far and the highlights that drove its last quarter. 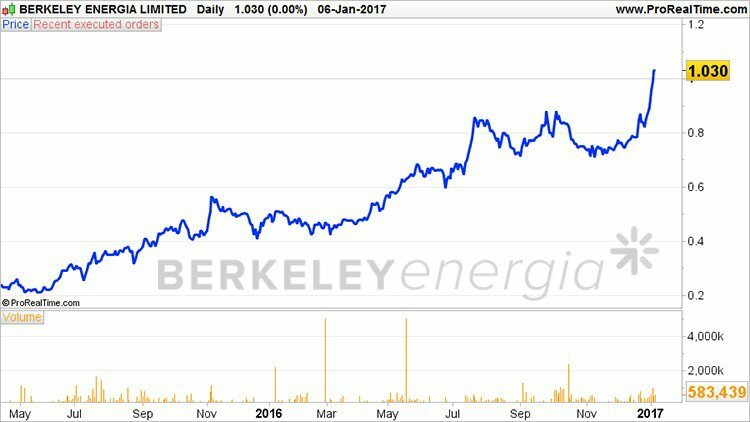 Upon release of its current quarterly financial statement, Managing Director, Paul Atherley said the last quarter of 2016 was one of the most significant for Berkeley Energia (LSE | ASX :BKY). Atherley was referring to the progress made by BKY on the first stages of construction, the signed off-take agreement for US$43.78 per pound of contracted and optional volumes – comparing favourably against the current spot price and the US$30M equity raise. 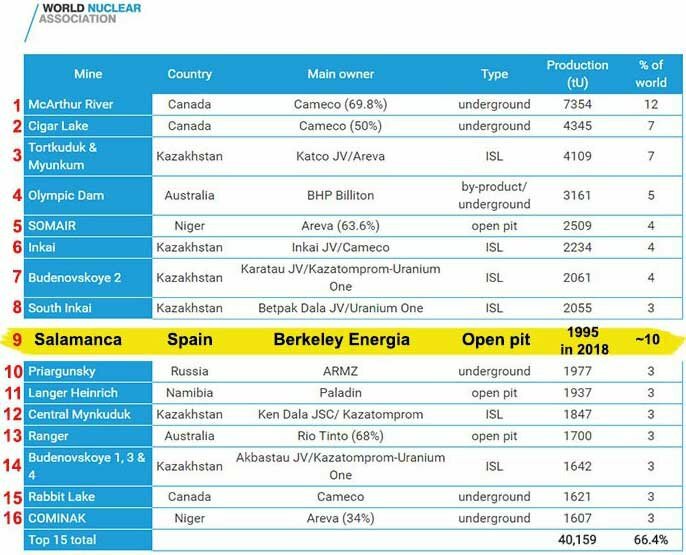 BKY’s Salamanca mine is being constructed just as uranium prices have begun rising after multi-year lows. As such BKY is receiving growing interest from US and Asian utilities looking to diversify their off-take with a low cost. The fact this producer sits in the heart of the European Union is another bonus. 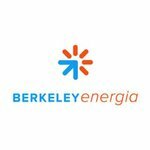 Investor interest in BKY is further amplified by the company’s intention to bring Salamanca online just as the US and EU utilities will commence re-contracting for medium to long term supply. With production expected late 2018 and construction now well underway, BKY has a year to ensure that smooth construction becomes solid production, which in turn could lead to a steady rise in the share price as risk in the project delivery diminishes. Long term investors must be very pleased with BKY’s performance over the last 12 months – BKY is up around 400%. Furthermore, a sturdy Definitive Feasibility Study (DFS) shows BKY can produce uranium at US$13.30/lb, while current prices remain around US$20/lb. So what exactly does Salamanca have to offer? Located in Spain, BKY holds the only uranium mine under construction. We’re not just referring to Europe here, but the world over. As much of the world turned away from nuclear energy as a power source, BKY has been diligently plotting its course, and now has the location, the sentiment and a unique position in the marketplace to put its production schedule right on track to capitalise on favourable market conditions set to underpin uranium demand/supply. BKY is constructing its mine with money in the bank and low capital and operating costs compared to any other uranium producer. Consider that operating costs are expected to peak at US$13.30/lb when compared to the industry average of US$30/lb, and you come to a quick understanding that BKY’s production schedule is very healthy and will enable it to commence production from day one. This fact alone could put BKY on par with the likes of bigger players such as Cameco, a Canadian producer worth C$5.7 billion which saw its share price rally by more than 40% since the end of October 2016. 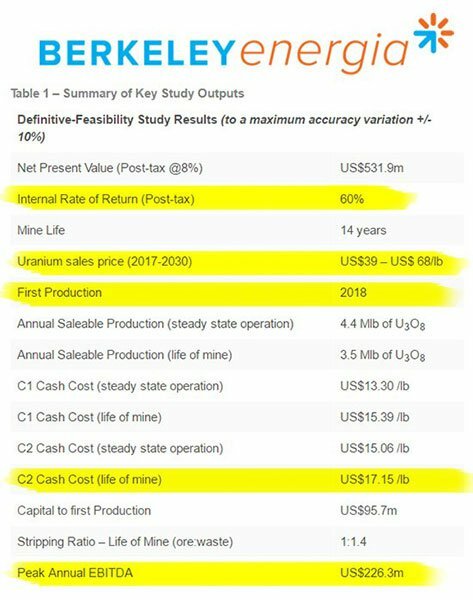 BKY will be hoping for similar traction as it readies its mine for production, reiterating once again that it holds the only uranium mine in the world that is currently under construction at a time when the world is approaching a supply/demand deficit that will be the largest the world has ever seen. Cantor Fitzgerald believe that the uranium price rise will be ‘violent’. It is also worth noting that the world’s largest uranium producer, Kazatomprom has bucked the trend and cut output by 10%, opening the global market . This prompted analyst Cantor Fitzgerald to say that uranium is likely to reach an inflection point as demand is set to outstrip supply. Certainly, the market has taken notice of BKY’s progress. BKY is making haste to mature into a profitable uranium producer within the coming 18 months, generating a peak annual EBITDA of US$226.3 million in the process and with a DFS and a successful fundraise in the bag, it is now focused on heading towards production. Uranium at the Salamanca mine is confirmed to be close to the surface making deposits easy to access with an open pit mine. The DFS has seen BKY achieve significant interest from offtake parties. 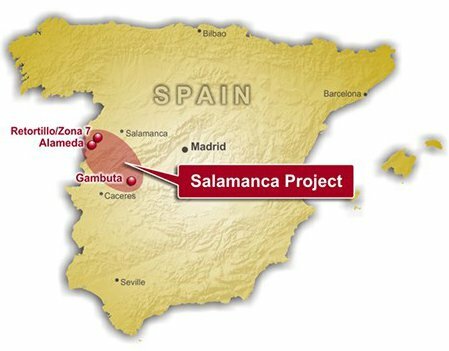 The most important agreement has been a signed binding off-take agreement with Interalloys for the sale of the first uranium production from Salamanca. BKY and Interalloys converted the previously announced Letter of Intent into a binding agreement that included a doubling of annual contracted volumes to a total of two million pounds over a five-year period. There remains further potential to increase annual volumes as well as extend the contract to a total of three million pounds, while a combination of fixed and market related pricing will apply in order to secure positive margins in the early years of production and ensure the Company remains exposed to potentially higher prices in the future..
An average fixed price of US$43.78 per pound of contracted and optional volumes was agreed between BKY and Interalloys, which compares very favourably to a prevailing spot price, of approximately US$18 per pound at that time. This indicates the market is fully anticipating a rise in uranium prices as BKY moves into production. BKY is also in discussions with other potential off-takers in relation to contracts with terms similar to those outlined in the Interalloys Agreement, with pricing at or around long term benchmark levels for term contracts. Contracts for sale will be entered into in the ordinary course of business as the company progressively builds its sales book with high quality offtakers. In order to hit the ground running, BKY has acquired or leased over 500 hectares of land, which it hopes will shorten its path to production by several months compared to previous estimates. The acquisition of this land will allow for the completion of the initial infrastructure currently underway and the commencement of construction of the processing plant in the first quarter of 2017 together with construction of a medium voltage substation, reagent storage facilities and buildings. The company is moving full steam ahead with infrastructure work including re-routing existing roads and power lines as a further step towards construction. Initial infrastructure development of the Salamanca mine commenced in August 2016 with the re-routing of the existing electrical power line to service the mine and a 5km realignment of an existing road. The road deviation will be completed in the summer along with development of pedestrian footpaths, secure cattle paths and the installation of a Wi-Fi network for the local villagers as part of BKY’s commitment to improve infrastructure for the local community. In fact, BKY intends to be highly supportive of the local community as to date it has received over 21,000 applications for the first 200 direct jobs it will create . It has estimated that for this type of business there will be a multiplier of 5.1 indirect jobs for every direct job created, resulting in over 2,750 direct and indirect jobs forecast when the mine is in full production. As we alluded to earlier, BKY will be coming into production just as macro-economic factors are ready to place uranium stocks into favour. Both the US and EU will be looking to renegotiate 80% of long term supplies over the next five years, but it is China that could be the ace in the pack. China is on course to boost its nuclear power capacity by more than 70% by 2020. That’s an expansion totalling 30 nuclear power reactors within the coming 3 years – an astonishing rate of growth that few economies could ever aspire to. 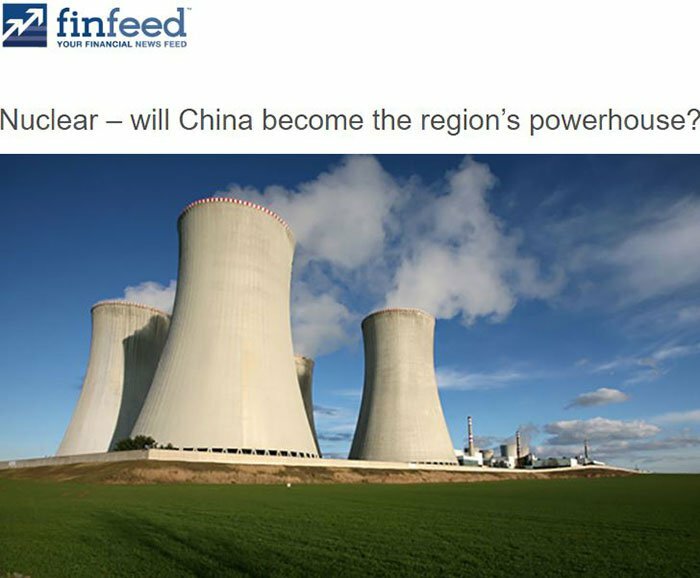 According to finfeed.com , China was seen as a major hold out as little as three or four years ago, as the world turned away from fossil fuels, driven by concern over climate change. Since then China has changed its tune – not because of massive concern over climate change, but mostly because coastal and more populous cities became hubs of smog from coal-powered plants. China wants to clean up its air – and nuclear power plants can help. Japan has also restarted its nuclear program as it attempts to bring back atomic power. In Japan, nine reactors should be in operation by the end of this year. A third Asian nation, India, also plans to expand its nuclear power capacity by around 30% by 2020. So the world is turning favourably towards nuclear and it could be given a further boost by the new US president. While the enigmatic Donald Trump hasn’t explicitly outlined his nuclear policy, it does look favourable. He has hired former presidential rival Rick Perry as Energy Secretary , a man who is openly pro-nuclear, which will serve Trump’s goal to expand the nuclear capability of the US. All in all it seems the nuclear industry is turning the corner towards improving its slice of the global energy production pie. Uranium prices have traded as high as US$137/lb. and are currently trading close to US$20/lb. Several analysts think these low levels aren’t sustainable given the expected increase in uranium demand, power consumption, population growth and international conflict deterrents. With all these factors in play, BKY is well set up to take advantage once it brings its production online. The world is experiencing a nuclear renaissance, with several superpowers now looking to nuclear facilities as not only economy boosters, but also a clean energy alternative. So with current market forces in play and the binding offtake agreements ... this appears to be one healthy looking company. BKY has doubled its initial offtake deal at US$43/lb while its production costs will remain at US$13.30/lb, which bears close to surface deposits that can be mined through an open-pit mine (the most cost-effective method of uranium mining).